We have a wide range of security labels that we can offer, each one offering protection against the item being tampered with, for example the tamper evident label which show when an attempt has been made to transfer the label to another product. These labels help to protect the asset and also deter theft too. 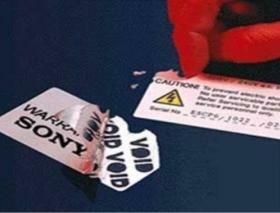 Another example is our void label which clearly shows the word VOID if an attempt has been made to remove it, or to remove it from the piece of equipment to which it is attached. These labels are made from polyester and they are firmly attached to the product with special adhesive, cannot be replaced over the wording smoothed back down or repositioned undetected. There are variations which we offer to you instead of the word void, some examples could be texts, patterns, logos, and colour, or numbering or barcodes. Many examples of security labels will be ones which we all will have come across in our everyday lives, include counterfeit labels such as and genuine product seals, DVD and CD seals, cartons, boxes and packaging, as well as asset protection. The police, for example, always use this kind of label when securing vital evidence as well as forensic items needed later as evidence in the event of a prosecution or inquest. Naturally we can offer a wide variety of shapes and sizes to suit your particular requirement from the standard 5,000 or more cutters we hold, examples such as square, circular and oval, in numerous sizes. For further information or anything that you would like to know about security labels or any other product, call our experienced and efficient team on 01293 551520 or fill out our online enquiry form for a free quotation.